You've reached a decision—that old, unattractive smile has to go. You're ready for a complete makeover—and the field of cosmetic dentistry has the materials, techniques and equipment to make it happen. But it could be a major undertaking requiring a fair amount of time and money. And once all the procedures are complete, what if you're not happy with the results? Fortunately, you don't have to wait with nervous apprehension until the end of the dental work to see what your smile will look like. We can give you a realistic preview of your new smile before we even begin—and not on a computer monitor. We can actually create a trial smile applied directly to your actual teeth so you can see your new look up close and personal, and in all three spatial dimensions. That's not to put down enhanced computer presentations. State-of-the-art imaging software can display an accurate representation of your future smile transposed onto an image of your face. But it's still a two-dimensional image, like any other photograph. It can't present the full range, movement or feel of the real thing. A trial smile can. We shape and sculpt composite resin to resemble the finished dental work and temporarily bond it to your teeth. Once applied, you'll then be able to see what your appearance will look like from different angles and movements. Although we'll have to remove the trial smile before you leave, we can photograph it so you can show it to family and friends for their reaction. While it's an added expense, a trial smile has two great benefits. First, it helps both of us "test drive" your new look and see how it performs in different ways: as you speak, when you're relaxed and, of course, when you smile. This allows us, if necessary, to fine-tune your planned dental work. 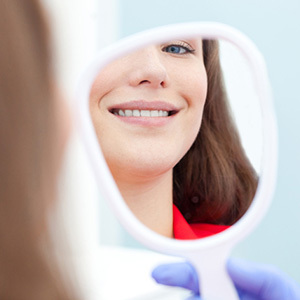 Perhaps the biggest benefit, though, is that it can reassure you you've made the right decision to remake your smile. With a trail smile, there are no surprises—you'll know what the end result will look like before any work is done. And that can be a great motivator toward obtaining the smile you've dreamed of having.